Have a wonderful 2017, Gang! Have a really happy New Year!! Where were you when you first heard this incredibly fun song? I was at 511 E. 12th Street in Manhattan… Long, long time ago. I still can’t complain! Life in the hinterlands continues to delight me. That said, though, I pretty much made up my mind yesterday that I’ll hang out here in this rental house as long as it remains feasible, and then finally move back to New York. Loyal readers of this lofty blog no doubt recall that for nearly 3 years, I was planning to move to Rhinebeck, NY, as soon as the developers decided when, exactly, they were going to tear down my old house. That prospect was going to drag on for another 5 years, at the least, and so this past September, I sold my old house and now I’m renting a friend’s house in the amazing hinterlands of Ohio, while I focus on the TV pilots, and on a couple of books I’m writing (and, now, I’ve added writing the one-man play about Caiaphas into that mix), and try to figure out what the heck I want to do with the next half of my life. Not only do I love Rhinebeck, but I have a couple of good friends who live there, and Manhattan is only a commuter train ride away, where most of the rest of my friends still reside. So that’s that. This morning, like every morning these days, I awoke about 6 am, terribly missing my cats. Not just the 2 who recently died, but Buster, as well, who died in September of ’13. They were “my babies,” and now it seems like it is only a heartbeat later and all 3 of them are gone. 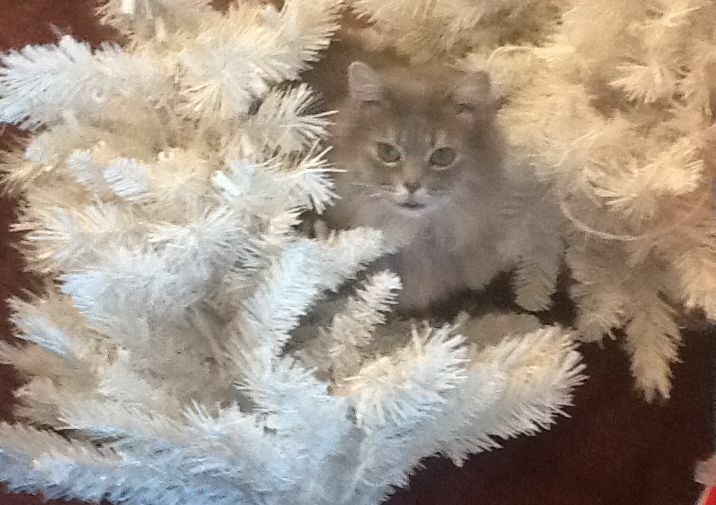 Fluffy at Christmas, about 6 years ago. And I couldn’t help wondering, yet again, what life is all about. I believe that immediately beyond what our 5 physical senses can detect lies the non-physical, which takes up Eternity. That we only perceive things here in the physical when we actually focus on perceiving them. Wallace Stevens described a similar idea in his famous poem “July Mountain” many years ago. I believe we all have inner beings that have inner beings, who have inner beings, who have inner beings, who have inner beings, like a truly endless Matryoshka doll. And because of that, I feel that God truly is an unknowable, distant “Being” that is like some sort of “dream machine,” constantly, eternally, unfathomably dreaming every single solitary thing, idea, thought, person, creature, into its own “being-ness”. This is partly why my ministry is called The Edge of God Ministry — because I believe we “exist” here at the farthest edge of God, a God that never ceases creating, while we evolve into deliberate creators, learning how to dream our own thoughts into “being” until we become an inner being of someone else. Until we all finally learn that everything is joyful and sacred and that everything, all across the board, exists because it chooses to. Eternally. And then we leave the physical realm and focus non-physically. Even while I can’t prove any of this, it’s still what I believe. And for me, it adds a heightened element of sanctity to all these things that mean so much to me in the physical, and that brings me joy. And it doesn’t lessen the profundity of anything else that anyone else chooses to take joy in and bring into existence. We each define what matters to us. It’s all sacred. And so I believe my cats choose to be here as much as I choose to have them in my life, and that only makes them all the more dear to me now that they’ve chosen to leave it. I try to imagine how this distant “dream machine” called God could create so much love and create such an intensity of “being here” in the physical, and I remain in awe of God. And in awe of everyone and everything who chooses to come here and “Be” for awhile, multiplied by however many aeons it’s been going on. As the sky became almost imperceptibly lighter, I knew it was time to stop missing “my babies,” get out of bed, and go to the kitchen and get a cup of coffee. Which I did. Only to bring the cup of coffee back to bed so I could continue marveling at creation. Today, I am going to be working on my one-man play about Caiaphas, also continuing to re-learn Biblical Hebrew, while also continuing to listen to the lectures on “Jesus and His Jewish Influences,” by Jodi Magness, a professor at the University of Pennsylvania; lectures which are absolutely astounding in their depth of knowledge of the Hebrew Bible and the Jewish Apocrypha and the uncanny degree to which 1st Century Jewish Christians continued to carefully craft stories of Jesus to fit prophecy from the Hebrew Scriptures. But it doesn’t make me love Jesus any less. To me, he grows more and more profound. What the heck was he really teaching back then that scared so many Jews and Romans, and that could make so many other Jews and Gnostics and Pagans cherish him so dearly that they were committed to making his name live forever? So, there I sat as the sun came up, enjoying my coffee and the thoughts in my head, keenly missing my cats but treasuring them just the same, when Daddycakes jumped up on the bed and stared at me so lovingly. He’s not tame, he’s feral; now semi-feral as he is really starting to trust me — after 4 1/2 years. He is such a beautiful cat, and so compassionate. When Bunny died so suddenly, the morning after we moved here, Daddycakes cuddled up against her lifeless body; he was clearly in mourning, saying goodbye. These cats are so dear. Remembering all this made me think of John Rutter’s lovely arrangement of All Things Bright and Beautiful, so I played it, over & over & over again, and eventually I got out of bed and resumed my participation in creating a really sacred day! Christmas is almost here, gang! I hope you’re enjoying the lovely season. Thanks, as always, for visiting! A blast from Christmas Past!! The East Village before gentrification. Avenue A in the mid 1980s. Christmas at 511 E. 12th Street. Awesome Neighbors here in the hinterlands! Well, I must say that living out here in the non-suburban hinterlands of Ohio continues to reveal its many charms! Not only do I get to drive past a couple of alpaca farms every day (and alpacas are serious cuties, gang!) (There’s even a local farm in need of someone to help feed and take care of a herd pf alpacas for a couple hours every morning — and me being the somewhat insane and very animal friendly person that I am, I was actually trying to figure out how I could fit that into my crazy schedule every day because I would love hanging out with alpacas but reason overruled my insanity). Anyway. 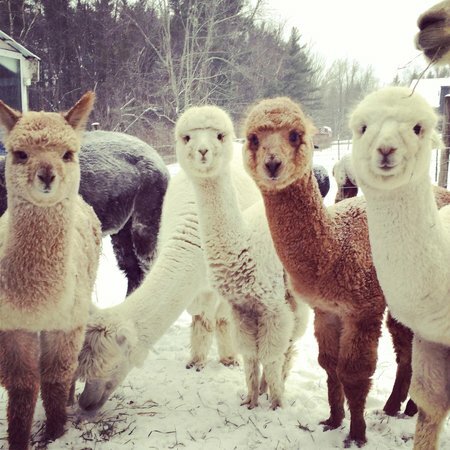 Not only do I get to drive past alpaca farms every day, but it also snowed here this weekend — a couple of inches — and it didn’t snow “in town.” Just flurries. Yay for the hinterlands! Loyal readers of this lofty blog will no doubt recall that I love snow. So I was thrilled that it snowed yesterday, all morning, then snowed again during the night. HOWEVER, when I awoke early this morning and managed to drag myself out of bed, I realized I was going to have to shovel the driveway. Yeegads! I did not want to do this because I am currently in a state of constant exhaustion. I was leaning heavily toward just letting it go and not shoveling the snow at all and hoping that it would simply melt away somehow later in the day, all of its own accord — when I, yet again, have to drive back into town. But moments ago, when I got up from my desk and went back into the kitchen for yet more coffee, I noticed 2 neighbors across the street, vigorously shoveling snow, and I saw that nearly every driveway on the street had already been shoveled and I thought, Okay now, people, this is seriously crazy behavior! I am too tired to drop everything so early, get bundled up in arctic gear and go out and start shoveling! But I also didn’t want to be the sole lazy person on the street with noticeable snow still in my drive… Darn it! But then, suddenly, out my large living room window, what did I finally see? My entire driveway had already been shoveled for me, and all the snow had been brushed off of my beloved 2001 Mercury Sable LS Premium Sedan!! Then I realized that those “2 neighbors shoveling vigorously” were actually shoveling everyone’s driveway! All up and down the street. OMG! How awesome is that??!! Okay, gang, have a happy snowy Sunday, wherever you are!! I leave you with this — not that it’s a Christmas song in any way, but I’ve been singing it a lot lately, so I regale you with it here. Okay, see ya! Thanks for visiting!